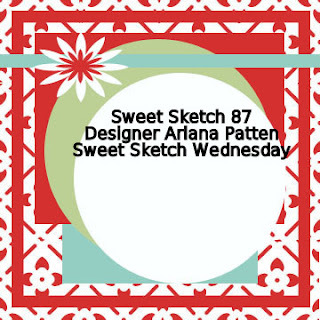 Meljen's Design's is our sponsor at Sweet Sketch Wednesday this week. We are showcasing four of her images this week at SSW. I know you will love all of them. But Melissa has so many more images that you will adore also, so be sure to stop by her shop and check things out. if you are the lucky winner this week at SSW so be sure to play along. 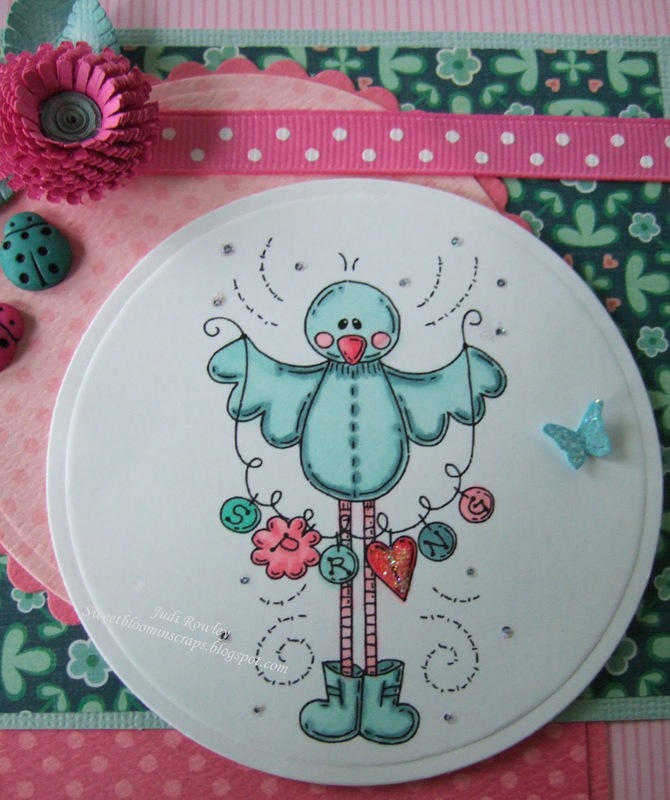 WHIMSY STAMPS STORE to browse and enjoy Melissa's wonderful images! My flower and leaves are made from the Cuttlebug Quilling Chrysanthemum Kit. Again I only used two of the three plates to create the flower. I inked the edges of the leaves to give some dimension along with giving them a twist. I added stickles to the "I" in SPRING. But more is not better! As you can see the "I" isn't really visable. While it was wet I actually move the glitter away from the "I" but it must have migrated back! 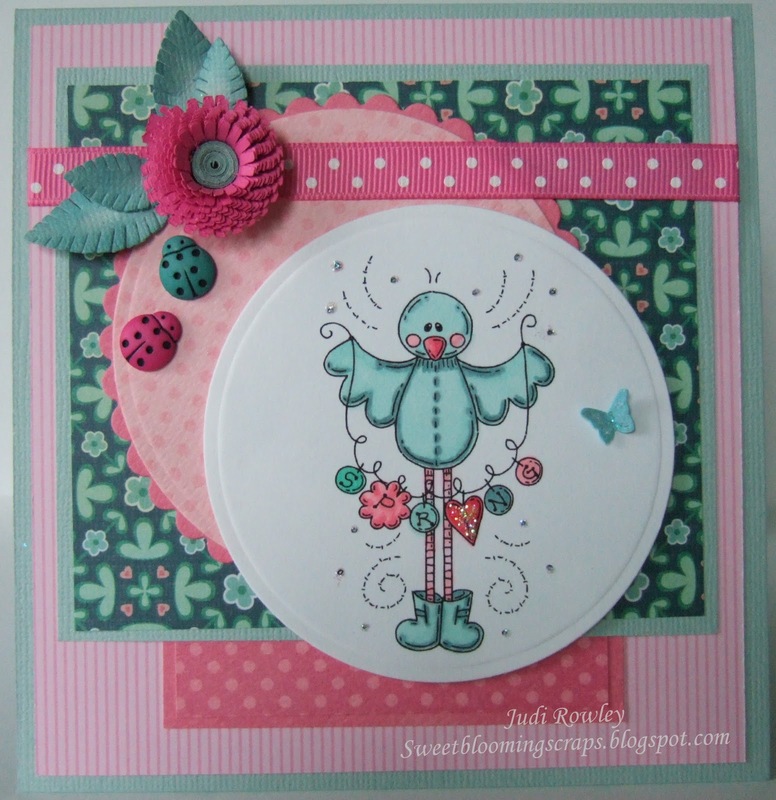 I also added the tiny butterfly with some added stickles from the SU Butterfly Emboss Plate. It was the perfect size. Oh I almost forgot, I was looking through my stash of treasures that Arlana gave to me...and I couldn't believe that I had two ladybugs in the two colors that matched this card! Have you ever seen a pink or teal ladybug????? Thanks for stopping by! I love your sweet comments! Have a great week and try to stay warm! Papers: K and Company Super Paper Pad, SU Pink Passion, Textured Agua? My favorite of yours!! This is gorgeous! I love the colors, your flower, and those little lady bugs!! Oh Judi this is adorable!!!! I love your image, totally love the colors and papers you used, and those embellies...FAB-U-LOUS!!!!! Have a fun week! The image is just wonderful the colours you used and your colouring is great, but that flower totally rocks, thanks for the inspiration!!! Oh Judi, your card is amazing...I love every detail of it. I had to even look at it close up. the colors are sooo yummy together. I have to learn how to make those flowers...can't wait to get the tutorial on them. I love those little lady bugs crawling up the front of the card. Just perfect all around!! Your flower is amazing! The colors you used are so beautiful together, and this is just as sweet as can be! Love those ladybugs too! GORGEOUS Judi! Love the colors and papers you've used - they are quite lovely. However it's your quilled flower and leaves that just leave my mouth hanging open in awe!!! And those darling lady bug embellishments - well they just send it over the top! Fabulous creation and inspiration! Hi Judi your card is totally gorgeous I just love those colours together they are just so perfect. What an amazing find for those lady bugs and no I haven't seen them that colour we do get a deep blue green peacock colour lady bug but the red are more common. I bought the Cuttlebug flower but I'm thinking of taking it back, I just don't think I will use it very much and would be better off buying a set of Nestabilities. I just adore your card it's so so striking. what a yummy card chickie ~ lovin that image..and your color scheme is just scrumptious ~ as is that flower and those leaves! thanks so much for the SSW inspiration! Judi you card blew me away this week. On of my favorite. I love that you used the quilling flower. The tiny butterfly just the perfect added touch. The papers are adorable. Thanks for all you do love ya. I love your card too, the flower is whoow!! And thank you for your comment on my card. The die I used is not a nestabilitie, but a creatable from Marianne Design. It is for sale here in Holland. Love it! Colors are marvelous! Love this card. That cuttlebug flower looks really great.